Programs like Soldier Ride® highlight the importance of managing mental health through physical activity and connecting with other veterans. TAMPA, Fla. (March 7, 2017) – Wounded Warrior Project® (WWP) Soldier Ride® recently rolled through Tampa, where a group of veterans enjoyed riding 36 miles alongside their fellow warriors. WWP program events like this give wounded warriors an opportunity to connect with fellow service members and learn they are not alone. Among the riders was Marine Corps veteran and wounded warrior Brian Fulford, who flew in from Alabama to participate in the event. 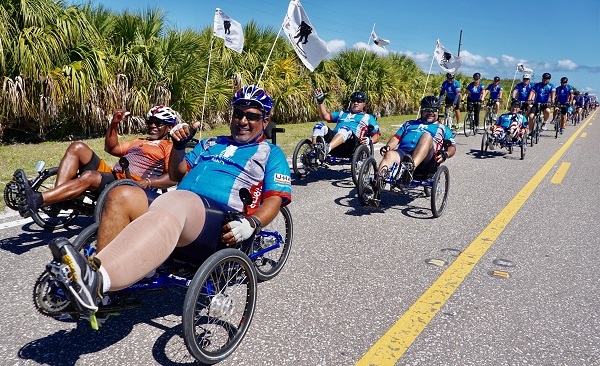 For many injured veterans served by WWP, Soldier Ride is the first time during their healing process that they venture out of their homes to connect with the community. Some wounded veterans face similar challenges when transitioning to civilian life, and gatherings like this offer a chance to bond with other warriors and learn they are not alone. Soldier Ride also introduces wounded veterans to WWP’s long-term health and wellness programs, which include physical training, outdoor events, and nutrition classes. In a WWP survey of the injured warriors it serves, more than half of survey respondents (51.7 percent) talked with fellow veterans to address their mental health issues, and 29.6 percent expressed physical activity helps. Programs like this highlight the importance of managing mental health through physical activity and connecting with other veterans. Soldier Ride® is a Wounded Warrior Project® (WWP) physical health & wellness program, which empowers wounded veterans to become well-adjusted in body, receiving the care they need to maximize rehabilitation and live active and healthy lives. Through adaptive sports, health, nutrition, and recreational activities where warriors can connect with one another, WWP helps veterans achieve independence and pursue an excellent quality of life.